The proposed “‘solution” includes a significant increase in income taxes, a freeze on wages, curtailment of old age pensions and higher energy prices. “We have no choice but to tell Ukraine the truth,” said Yatsenyuk. A $1 billion in loan guarantees is granted “to help stabilize Ukraine’s economy” [aka impoverish]. The bill would also authorize “assistance for democracy, governance and civil society programs” [aka support to ultra right wing groups] and “enhanced security cooperation”. The latter would imply channeling financial support to the National Security and National Defense Committee (RNBOU) which is headed by Andriy Parubi, co-founder of the Neo-Nazi Social-National Party of Ukraine (subsequently renamed Svoboda). The National Guard, which constitutes a civilian militia is under the helm of Dmitry Yarosh, leader of the Right Sector, which is also supported by Washington. It should be understood that the IMF money will not enter the country. It is earmarked for the reimbursement of Ukraine’s short term debt. It’s fictitious money. The combined impact of currency devaluation and the removal of fuel subsidies will trigger inflation. The austerity measures will enforce a freeze in nominal wages, leading to a collapse in real earnings. The IMF pledge was announced on March 27. the 27 of March, coinciding with a neo-Nazi Right Sector assault of the Parliament building, demanding the resignation of the Minister of the Interior. On March 28, the Ukrainian parliament adopted legislation which was “proposed by the IMF to secure an international financial aid package”. Contrary to Yatsenyuk’s statement, there is continuity with a track record of IMF-World Bank reforms imposed on Ukraine since the collapse of the USSR. The Ukrainian people should understand that this agreement reached with the IMF will have devastating social implications. 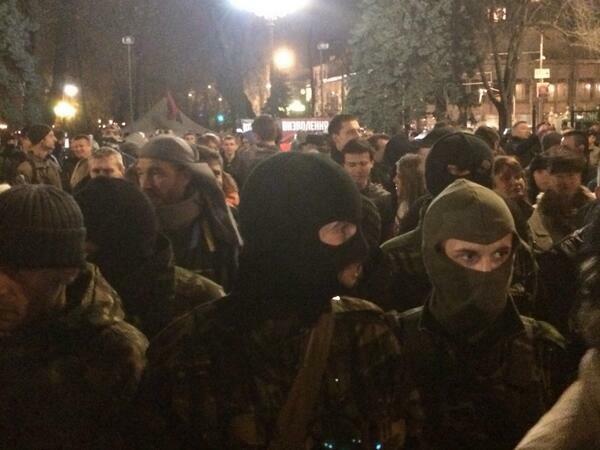 This government integrated by Neo-Nazis has betrayed the people of Ukraine. It is not acting on behalf of the people of Ukraine, it is obeying orders emanating from Washington and Brussels. The IMF economic package is an act of economic warfare. Its acceptance by the self proclaimed government is an act of treason.